What does it mean to Adore? One of my greatest joys is to hear my sons playing their instruments in the house. My youngest plays piano—sweet and melodic. My oldest plays electric guitar—not quite as sweet, but reminiscent of the 8Os rock I used to crank through my boom-box. Either way, it’s a glorious sound, the sound of people using their talents to touch another soul, bringing joy to someone fortunate enough to be within earshot of their creative expression. I can honestly say, the music somehow restores my soul and helps me connect with our praise-worthy God. I was fortunate to grow up in a musical household. My Mom would come into my room in the morning and actually sing to wake me up. She would also sing in the course of regular conversation. If someone inadvertently made a comment that came anywhere close to resembling a song lyric, she’d pick up there and sing the chorus for our listening pleasure. But what I loved most about having a professional opera singer for a mother was standing next to her in church. Those hymns take on a whole new meaning when you hear them belted out by a soprano who can hit all the notes. And (side note) I have yet to hear a rendition of “O Holy Night” that holds a candle to hers, which I heard each Christmas eve at the Midnight service. Simply spectacular. My Mom always said that God loves to hear us sing praises to God. 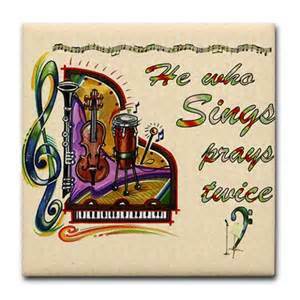 She has a poster hanging in her music room that reads, “He who sings prays twice.” The phrase is sometimes credited to St. Augustine, but the sentiment first appears in the Psalms. The Psalms, the song book of the Old Testament, record both personal and corporate songs. They give voice to our praise. Often times, the Israelites would sing these songs of praise recorded in the Psalms as they approached the temple, preparing their hearts for worship—preparing themselves to meet with God. I don’t know about you, but sometimes I skip the preparation part. I don’t prepare my heart to speak to God, and I don’t prepare Him to hear from me. I tend to rush into my prayers, telling God all of the things I want or need and “reminding” him how he could help me. The not-so-positive effects of thinking of Jesus as my friend is that sometimes I forget to think of him as the Holy, all-powerful Creator God that He is. Coming before him should be akin to coming before royalty. And while a curtsy is certainly not necessary, starting a prayer by adoring and worshipping the One who is the author and creator of life is more than appropriate. It is essential. One helpful way to remember how we can pray is using the acronym, ACTS. Adoration – Confession – Thanksgiving – Supplication. Adoration means to worship and acknowledge the majesty of God. Adoration is to sing God’s praises. We hear that sentiment over and over in the Psalms. Take joy my King, in what you hear. May it be a sweet, sweet song in your ear. He lets me rest in meadows green, and leads me beside the quiet stream. He keeps on giving life to me, and helps me to do what honors him the most. Lord, we adore you. We bow down before you, acknowledging that you are Jesus Christ, our Lord. All praise and honor belong to you. We confess that sometimes we neglect to praise you as we should. Please forgive us. Thank you for the life you give us each and every day. Help us to remember who you are and whose we are. In your precious name, Amen.